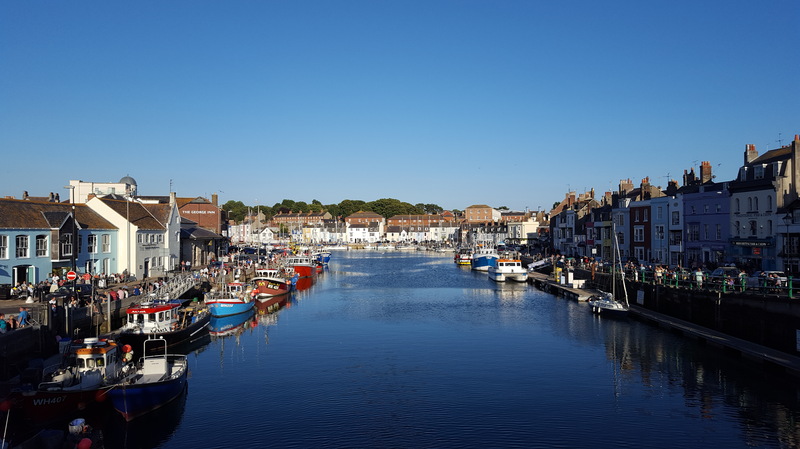 Mini break in Weymouth…Sun, sweary lady and genius chip shop man! Is it me, or is the south coast (uk) becoming fashionable again? It was decided that it would be a super idea to have a long weekend in Weymouth. After the initial panic of realising that every hotel and B and B had ‘No Vacancies’ in the window, booked a room with breakfast in a small hotel, on the sea front. Confusingly, in a room at the back and you have to go around the side of the hotel to enter it. However, it was clean and ‘newly decorated’, very near the beach and shops so it served the purpose. On Saturday, the sun shone brightly and I decided to languish on the beach and make use of the neglected kindle. I like real books but the device is OK on holiday. I’m reading another Mark Edwards book and devoured, apparently, 50% of it. Plus, watching the pregnant, smoking, lady screeching at her 6, yes 6, children. Who, of course, had to plonk themselves next to me. Not sure whether I was fascinated or mildly irritated. However, during the afternoon, some soft drizzle descended on us and the sweary lady dissappeared with her brood. I dragged my chair under a shop roof and was then entertained with another group of youngsters throwing stones at cans. Clearly, the sign on my forehead ‘noisy groups sit near me’ was working. But the sun soon returned and the chair was dragged back towards serenity and sunshine. It was decided that fish and chips would suffice for the evening meal at the conveniently placed chippy near the hotel. The chip shop man had a spray gun for the vinegar! This means the salt stuck to the chips and were devine. Chip shop man is a genius. It is official. Oh, it does not stop there. Went to a local pub and was enjoying the dulcet tones of the karaoke, and in walked a subdued gentleman dressed as a bride with his entourage. (Think my son in law got off lightly as Mario.) They all ordered drinks and sang Help! (how original) and I looked out of the window and saw a gang of laughing, lively girls dressed as Mexicans (sombreros and capes) coming down the hill towards the pub. Yes, they came, saw and conquered the karaoke (I can’t get no satisfaction). When a woman, sitting in the table near us, started slapping a man on his bum with her slipper, I decided I couldn’t take anymore madness, and headed back to the hotel. Decaf coffee, sanity and sleep. Day 2 I decided to take the car to Durdle Door and then to the Studland beach. Parked in a lane nearby and walked and as I reached the Durdle Door car park felt smug and pity as I strolled past the long queues for the pay and display machines. 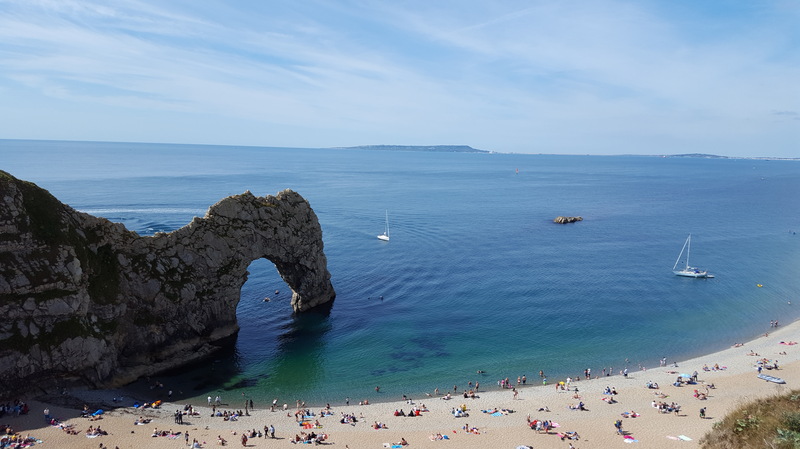 Durdle Door is stunningly beautiful and encompasses everything devine about the English coast and countryside. The weather was sunny and hot and I climbed down to both of the beaches to enjoy the scenery, so endured a hot workout too. Studland beach was incredibly busy and difficult to park. Only stayed for a couple of hours and then returned to Weymouth. The third day was spent on the beach and travelling home. Another weekend over which was rather eventful, had splendid scenery and fabulous weather. Felt great to visit the south coast again, and next time I won’t leave it so long. These pictures are beautiful! It looks like a wonderful place to visit.